Great for stirring sauces, soups, and so much more, this 14" wooden spoon is an indispensible kitchen tool, essential for everyday use! Made of durable rubberwood and featuring a 3/8" diameter handle, this spoon is perfect for mixing thick dough and batters, fudge, frosting, and other culinary and confectionary creations. The broad and oval concave bowl enables thorough mixing, stirring, and tossing of ingredients during food preparation, while the smooth edges and sanded surface ensure a quality product for your kitchen's use. Quality wood spoon without any splinters or blemishes. Long handle provides nice leverage when mixing or stirring, while the spoon itself is thick enough to even scrape scorched pots and pans. The 14" wooden spoon is a great addition to my kitchen tools, its feels very quality and at a very affordable price. I'm using it in stirring sauces the long handle is very comfortable if you dealing with small-medium size pots. I love this 14" wooden spoon. It is great for mixing both hot and cold food items. I use it for doughs, batters, as well as on the stove. This is a great wooden spoon. Its long, over a foot to be exact. I like how affordable it is also, and how versatile. Would buy again. You’ll love this handy wooden spoon perfect for all baking and cooking projects! Nice long handle works great for reaching and stiring foods in jars and hard to reach places. Thank you! I don’t think it is possible to beat this price. I have a bunch of these and am always reaching for these. Great for making marinara and they don’t even absorb the red from the tomato. Also great for a rue to gently scrape the bottom of a pan. Heavy duty wooden spoon. Handle feels nice and sturdy. Great for mixing batters, sauces, etc. Easy to clean and also heat resistant. Won't scratch pots and pans. Great long 14" spoon. Perfect for making soups or stews or any deep pot. The spoon is very sturdy and can handle use with thicker stew or dishes. This spoon worked perfectly when preparing my salted Carmel and was a quick and easy clean after having the hot sugar syrup on it . I recommend. I use these a lot. Durable and sturdy and great for stirring larger pots. I actually have washed them in the dishwasher (home dishwasher) and they have been ok. These are great spoons. They aren't so thin that they feel fragile but aren't so thick that my kids can't wield them. They helped with dinner the other night and used them. the spoon is a good length, long, but still agile. It is fairly well made, with no splinters, especially for the cost, and is a great value. wooden spoons that don't scratch any bowls and platters we needed about a 12 set will be back for many more thanks for the items and value ! Decent wooden spoon - the color of the wood is very pale and doesn't have the grain texture you usually see. I prefer the beechwood spoons Webstaraunt offers. Still a good product. This is your pretty normal wooden spoon but I was really happy with how well it holds up and what I got for the price that I paid for them. This spoon is a great utility tool to have in your kitchen. Keep it at arms reach and use it for just about anything. I like to use wood spoons as not to scratch my pans. With a long handle a sturdy construction, this 14 inch wooden spoon works great when mixing ingredients. Especially if using a deep bowl, this spoon effectively turns batter and base ingredients. These wooden spoons were used for our wood burning business. They were durable and very easy to burn pictures into. Customers loved the spoon length. If you are in the market for a very inexpensive wooden spoon this is a great product. This spoon can be used on nonstick cookware and it will not scratch the surface. The spoons are great for stirring large pots of soup, sauce, and various types of stock. I love these wooden spoons for baking and cooking applications. 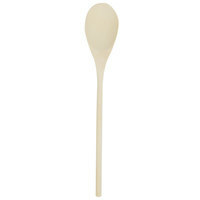 Very good value for the price, and very useful to have many of these spoons in the kitchen. The 14 inch wooden spoon is made of nice smooth wood. The handle is very long and great for large deep pots. The spoon is good sized also and rounded enough to scoop food up. These wooden spoons are fantastic for the price. Have the classic wooden spoon look, plus they're pretty good quality and cheap, so you can buy a lot. This is a basic, lightweight wooden spoon. The 14 inch size is convenient for larger pots. I prefer the Beechwood Wooden Spoons to these, but for the price they are a good value. The 14 inch wooden spoon is great because it allows for easy stirring in large stock pots, it is very strong and easy to clean. This wooden spoon is a lovely addition to any kitchen. It does not mark surfaces and works for non stick and heat as well as cool. It does mark easily so any spices will leave a stain on it but that is actually kinda cool to look at. Very lovely wooden colorings. This fourteen inch wooden spoon is perfect for large mixing bowls. I use this size with eight to twelve quart mixing bowls and it is a great fit. The spoon is a standard wooden spoon but allows me to easily fold egg whites into any mix. I would recommend this spoon. I use this for everything! stirring pasta, creating sauces, pretty much anything I could need it for. It cleans well in the washer, and holds up to any task I throw at it. The long handle is great too. The 14" Wooden Spoon works very well for my pasta sauce. The quality is good as well as the price. I am very happy with my purchase and definitely recommend! My favorite size, 16in is good for big jobs, the 12 is average but this is that happy medium, I love the 14" wooden spoon. We don't have to worry about these warping or bending from heat which is nice. Has a good look to them and a nice texture. I really like these wooden spoons as a way to stir chili. Eventually, just like cast iron, it will pick up flavors to it from the smoke! A great spoon for the price. Nice longer length in the handle for the larger stock pots. Nice size of spoon giving great control in stirring. Good addition to our kitchen. I'm adding another batch of these to my cart. They have a great bowl size and a nicely sized handle for easy, comfortable gripping. The price is so inexpensive, I can burn one and replace it with a shrug! This is a good spoon and a good length. It is great for stirring all sorts of things. It is good for stirring hot pots because the handle won't get too hot. I love cooking with wooden spoons, especially when boiling anything. My grandmother has always told me if you leave a wooden spoon laying over the bot it won't boil over, so I use gem all the time. These are a great price and great quality product. I highly recommend to anyone looking for a quality wooden spoon for mixing and stirring food in sauce pans to soup pots or general mixing bowl 's this 14 inch wooden spoon from WEBstaurantStore perfect for so many applications. This 14” wooden spoon is a little longer than others, but it is strong and can get down into the bottom of larger bowls easy to make sure your getting all the contents without waste. Exactly as described. Good quality and sturdy. I will be ordering more for gifts for other friends and family that love to cook and bake. These tend to splinter easily but they work if you are just needing a basic wooden spoon these are the ones that you need. They are nothing fancy! I have so many of these 14" Wooden Spoon in my kitchen, they re so amazing and so versatile! Great price too! must have in any food facility for mixing, stirring etc. This spoon is perfect for tasting between stirs and placing foods on other surfaces. The length is good for stirring in saute pans or short-sided pots without contacting the contents. Great wooden spoons that can be used for many purposes. I often use mine for baking or making scrambled eggs. Easy to clean and visually appealing. The 14" spoon is our kitchen's utility spoon. We use it when stirring congee or soup, or stocks. It is easy to wash, and can be re used. the 14" wooden spoon is a great classic kitchen must have, with the 14" handle its perfect for stiring sauces in my 6qt sauce pan. This spoon is great for stirring sauces. The length is absolutely awesome for when I use it to stir sauces over a hot pot, now my hands don't burn from the heat. These are a nice size for deeper pots to stir and mix with. I like using them when I am making salads, so my fingers don't get in the dish I am making. If any kitchen ever really has enough cooking spoons I've never seen it. The 14" handle on these is very convenient. Nice spoon for little cash! The 14 inch wooden spoon is very well made, it is strong enough to mix heavy ingredients as well as the wood makes for safe pot stirring. Good price. I purchase this for my home. I will no longer be buying the standard consumer,brands any more as this is by far the thickest wooden spoon I have ever invested in. At almost half an inch thick I won't be needing to purchase another in the near future. Thank you WEBstaurantStore for the very high quality and very low price. These are your standard, nothing fancy wooden spoons. They work great and are holding up very nicely to a variety of tasks. I am very pleased with them. I find its nice to have several different sizes, which isno problem considering how inexpensive they are. This is just your basic 14" wooden spoon. I have no complaints about this product, and I think it is a great value and price. The 14" Wooden Spoon works great when I am sauteeing onions and Celery. The 14' wooden spoon is very sturdy and I am glad that I purchased. Good quality. I bought this spoon to go in my knife kit so I can make pate a choux at work without breaking my spatula. It works perfectly. I have definitely bent it working the pate a choux, but it hasn't broken on me yet! This Wooden Spoon seems to be very durable and is perfect size for those larger pots. It goes through the dishwasher with ease and is a good value for the price. These wooden spoons are very well and simply made, but also extremely durable. They are extremely versatile and can be used from sautéing to baking. Great value for the money and great long handle. Wooden spoons are great because they don't hurt your ears when stirring in a metal pan nor do they burn your hands when touching them. Nice thick spoon. Very smooth finish with no rough spots or splinters. These are cheaper than the superstores and much thicker, they just feel better in hand. This 14" wooden spoon is a great length for large pots. We use it for mixing soups and sauces. We also use them for mixing batters and doughs in large mixing bowls. I love how strong and durable they are. I actually use this spoon as decor instead of actually cooking with it. It is a beautiful standard wooden spoon but has that classic look to it that gives it an old look.